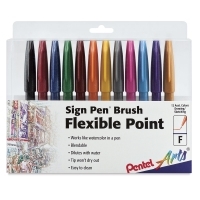 Pentel Arts Brush Tip Sign Pens offer richly saturated colors that are fully blendable with water and Pentel Sign Pen colors. The waterbased dye ink is bright and intense. Tips are wear-resistant, pressure-sensitive, and flexible for different techniques. Snap-tight cap that prevents dryout. This set of waterbased Brush Tip pens includes one each of Black, Blue, Brown, Gray, Green, Ochre, Orange, Pink, Red, Sky Blue, Violet, and Yellow. ® Pentel is a registered trademark.® Pentel Arts is a registered trademark. 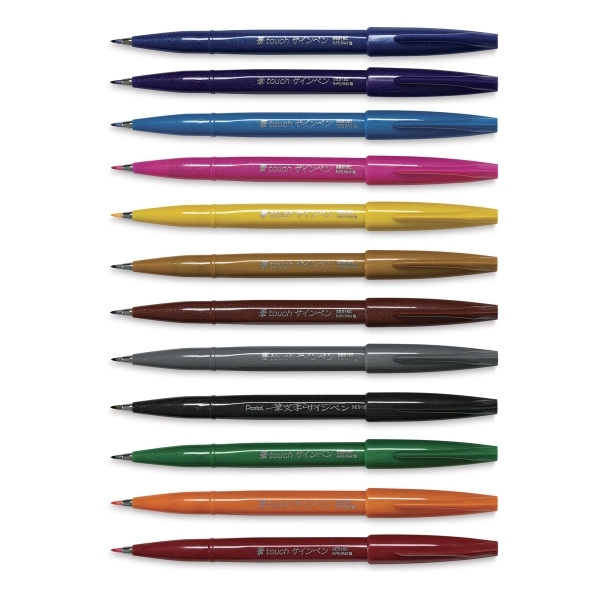 ® Sign Pen is a registered trademark.